This month for Literary Locals I have decided to do something a little different. I've decided to talk about where my love of locals came from!!! The man who inspired my love for them has been on my mind a LOT lately, so I got to thinking . . . Why not put some of my thoughts into words?!?! While growing up in Montana, I remember visiting my Grandparents' home just about every single day. We literally only lived blocks away or across a little field and I loved going to visit them. Whenever I would visit, I would be surrounded by books. Books laying on the end tables, in bookcases, in stacks on the floor . . . they were everywhere. One book in particular always fascinated me . . . it was a book on Montana ghost towns, a topic that especially fascinated me after a visit to Bannack and Nevada City. I can still picture this book . . . blue cover and I believe a picture of one of the buildings in Bannack. (Unfortunately, I do not remember the name and cannot find my own copy!) I would just sit and read it, sometimes having conversations with my Grandfather about the history of Montana. Conversations that even surrounded the buildings in the very pictures featured . 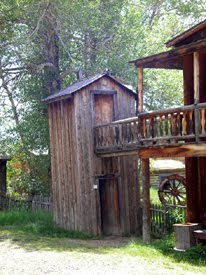 . . the school house in Bannack and the two-story outhouse in Nevada City (yep, that's right, an outhouse on top of an outhouse!!!!). Since then, I have always turned to my Grandfather for recommendations on good Montana authors. My Grandparents buy my children a Montana children's book every year for Christmas (and sometimes for birthdays). It's not uncommon for us to receive books randomly in the mail either. Books from locals or about Montana in general that my Grandfather in particular thinks we would enjoy. And, he is usually right!!! I have not yet been recommended a book by him that I have not liked!! My Grandfather has inspired me to read my locals from a young age and he has continued to inspire me even today. I can always count on him for good book talk!! But, that is why I've been thinking about him a lot lately . . . I don't know exactly how well this will continue to work in the future from so far away. He has been fighting a skin cancer that surrounds his vocal cords. He received an intense treatment of chemo and radiation this past spring. Though all tests are showing up negative for cancer, complications still result and there is a very real possibility that his voice box will need to be removed. So, to say the least . . . he has been on my mind every time I pick up a book and then some. I'm hoping once all this business is taken care of and he is once again on his way back to recovery that he will continue to chat books with me . . . and YOU!! I've asked him if he would be inerested in an interview for this site or to help me in reviewing books. Maybe you will get the opportunity to be inspired by him and his taste of the Montana locals too?!?! Until we just wait and I reflect on his many influences . . .
Who has inspired you and your reading? Mary over at Books Gardens & Dogs highlights a local in both author and landmark with A History of the Golden Bear by Robert J. Carvanous. Interesting story! And what a great service he did for you by introducing you to locals and encouraging your interest. Will definitely be thinking of him as he struggles physically--perhaps he will embrace e-mail to help communicate? Oh this is the coolest post ever! I've been to WY, but not as far up as MT. I so want to go before I die. Love the history of how your grandfather inspired your love of reading and of local authors! Sending good wishes his way that he'll make a full recovery. J. Kaye . . . I definitely recommend MT!!! And, thank you!! Alexia561 . . . LOL!! I agree about the outhouse!! You wonder why it still is imprinted in my mind all these years later!! :) And, thank you for the wishes! !